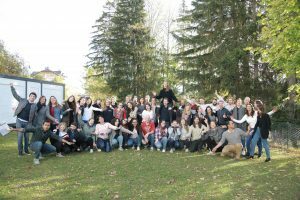 From 19th to 25th of October 2018, oikos members, alumni and partners came together in a beautiful village of Leysin, in Vaudois Alps, where they immersed in the development journey made up of lots of energetic discussions, poignant and heartfelt exchanges, impact-driven workshops, and brilliantly funny and invigorating energizers. The LEAP Meeting is a kick-off point for a larger, 9 month-long development program that engulfs participants, and urges them to reflect on their experiences in order to grow and become responsible leaders at a forefront of sustainable development. To render this ambitious task possible, LEAP created a complex web of activities directed at personal, professional and societal development, moreover it put participants in charge of defining the character of this multiplexity by taking into account their needs and inviting them to organize and lead main activities in the program. For many of the participants, the LEAP Meeting experience was a time of desired stillness. It allowed them to travel down the memory lane and understand defining moments of their life: recognize how these fragments of past shaped their character and walked them to this very moment of awkward intimacy with strangers, with whom they felt comfortable to retell the story of their life and to listen to the account of fellow LEAPers. By sharing this moment of vulnerability, participants could see beyond the veil of the social self. “If I had to pick only one thing that I learned from the meeting it would be to take the time to get to know everyone around me, regardless of any differences or preconceived ideas. There is something beautiful in each and every one of us, and I am now more than ever curious to discover that beauty” – shared Fanny, oikos Lund alumna. The meeting also helped build trust and breach the distance among the participants. “I feel safe and supported… I know I am not alone… I appreciate moments I had here…” – said one of the participants from oikos Tbilisi. The LEAP meeting challenged participants to reflect on their purpose in life, examine how what they do is aligned with their values, what aspects they consider contradictory and how they can better get in touch with their ideal. “The meeting helped me to think about myself and my own stories. The workshop that focused on the values and motivation, we find important in life, was great and this is something that everybody should do more often! I realized that I want to become a person worth following. This is not an unreachable goal anymore, but a journey I am onto right now!” – noted Magdalena from oikos Graz. The meeting hosted a number of workshops to enhance participants knowledge and skills related to their day-to-day work on sustainability at their own organizations. The workshops covered topics as diverse as strategy and organizational development, recruitment and onboarding, talent management, project management, fundraising, communications, organizational culture and conflict management, local and international collaboration, the list goes on… And in charge of all these were our participants. They prepared content and exercises, shared their experience and encouraged others to take bold steps forward. “oikos people surprise me! At workshops they are so confident, so good at negotiation. I see passion, and so much knowledge” – said Peiwen, oikee from Lille. In addition, our participants, including attendees from our partner organizations – UK National Union of Students, REFEDD, rootability – were encouraged to get spontaneous and host a session on the topic of their choice or one participants asked for. So, it took just a few minutes for the most daring to spread across the hotel rooms, bring together other participants and discuss topics such as message delivery, innovation by design thinking, Podio intranet and oikos digital presence. Some attendees joined our LEAP coaches, Sophie and Tiphaine in their ad hoc book club to talk about “Change: Why we need a radical turnaround” – a book by Graeme Maxton, former secretary general of the Club of Rome. The discussion topics changed swiftly and oikees kept going in and out from one busy room to another, but the overarching theme of sustainability was always the key focus. 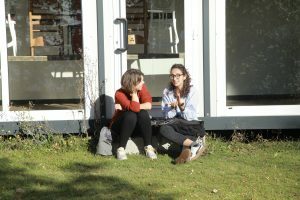 LEAPers shared information about their local sustainability projects and exchanged ideas on new potential developments. In the words of Luisa from oikos Paderborn “oikos is an amazing community! We can learn so much from each other. It is so satisfying to see, that you are not the only one interested in bringing sustainability into economics and management”. The LEAP Meeting tried to inspire participants to develop new initiatives that reflected their attitude towards sustainability and was aligned with their core personal and professional values. The LEAP Meeting encouraged participants to look into organizational development, share their learnings, value teamwork, and collaborate with each other for greater sustainability impact. The LEAP environment enabled participants to understand that their collective action has big influence on the world around them. For this reason, oikos members talked about the organization’s strategy and governance, business model, organizational guidelines, and ways for institutionalising membership. They joined our partners to discuss new channels for collaboration, a framework for changing the education system, as well as international campaigns for change. “I got to know that behind me and my own chapter, there is a large group of people, who share the same mindset with me, they are working very hard to achieve something we all care about. Since I am a newbie to oikos, joining LEAP gave me a fast access to know what we do, what we value and who we are. I got so motivated after the whole event and have a clearer picture of what to do in the future.” – said Peiwen. The LEAPers joined efforts for the the World Climate Simulation. They even welcomed over 20 students and teachers from the Leysin American School to the event. This one evening, people from very different backgrounds: living as far as in India and being as young as 11 years old came together with one single mission – to save our planet. Katie, our session leader summed up the spirit of the task that lies ahead: “it’s not going to be easy, but it’s going to be worth it” – she remarked. 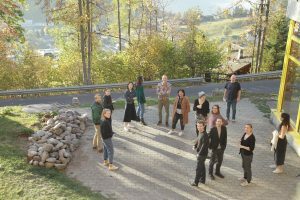 And she quite easily found people willing to stand up for the challenge, “I gained an urge to change the trajectory of our fate” – said Jakob, oikee from Bayreuth. As the LEAP addressed these diverse domains of our life, its main lesson lied in the acknowledgement that this division is indeed arbitrary: personal, professional and societal developments are interconnected and intertwined with each other and one cannot be fulfilled without making progress in all three dimensions.